Campaigns are able to focus on the important matters facing them since the distribution end of their chosen merchandise in being handled externally by a reliable source. For this, we have become a trusted name in political merchandise programs, including Gore 2000, Kerry 2004 and countless others campaigns. A catchy mailing for prospective attendees of an annual franchise conference in Las Vegas. We wanted a way to point out that simply doodling ideas for a restaurant is not a sufficient plan of action when the goal is to launch a successful business. The napkin, which list the most basic ideas an entrepreneur might think of, was to be placed in a see-through envelope along with a cover letter and fact sheet and a sticky note on top reading eWe Should Talk About This.i The hook was to be that this is NOT the correct way to formulate a business plan. The cover letter would then explain the services that could be provided which are comprehensive start-up/management plans for new restaurants. The National Rifle Association created a group within their organization of their most active and loyal members. This group is know as the iGolden Eaglesi. The client wanted a way to thank the individuals for their membership. 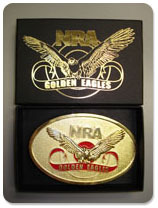 Come up with a custom belt buckle and packaging to thank members for their participation and loyalty. These buckles were created and placed in a custom box that was mailed to individuals with literature and membership information. 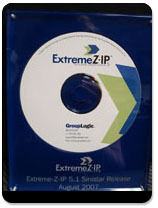 In the package the client has the option of packaging information on new and current programs in order to boost awareness. The Client in partnership with the NRA has run the program successfully for years. .Sending out custom gifts tailored to the market maintains the current membership base, and boosts new membership through promotional products. Cardiac screenings are imperative for early detection and treatment of heart disease in women. Sister to Sister is an organization dedicated to offering women FREE screenings in order to promote heart health. In addition to these screenings Sister to Sister also wants to increase awareness about this disease which is the #1 killer of women in the world today. They promote healthy lifestyle changes that can reduce the risk of heart disease. We developed an online store that includes Tee-shirts, Caps, Custom Bobbleheads, Custom necklaces and pins. The sterling silver pins are gold plated and sent to anyone who makes a $100 donation to the Sister to Sister foundation. The store is linked to their website and all products are stored at and shipped from Mac Mannes, Inc. The client wanted to increase awareness for Deep Vein Thrombosis, a common but serious medical condition that occurs in approximately two million Americans each year . They created the iAwareness by Designi program, and the idea that Doctors and nurses could customize socks and wear them at hospitals across the country. A custom Design Kit was created with all of the tools needed to design your own socks. DVT Awareness by Design is a visual way for people to show their support and increase awareness for DVT. The client hoped that by designing a sock and wearing it proudly the recipient would serve as an ambassador in their community to educate colleagues, patients, friends and family about DVT care and treatment. DVT Awareness by Design goes beyond building awareness of signs and symptoms by actively empowering healthcare communities and individuals to show their support through designing and personalizing their own socks, to showcase what DVT means to them. To recognize annually those individuals and organizations committed to maintaining the sustenance of our nationis living marine resources. The recipients represent industries, organizations and individuals that show outstanding performance, achievements and leadership to the science and management in promoting the best stewardship practices for the sustained use of the Nationis living marine resources. NOAA has archived several beautiful drawings of different marine species reflective of the resource and/or region benefiting from the stewardship contributions made. 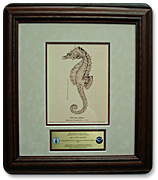 Using these illustrations we make custom matted and framed pictures which include the NOAA logos and the name of the person or organization being honored. What began as a simple sketch of a fish and the idea to pay tribute to those who have made strides in the effort to preserve our living marines becomes a truly magnificent piece of artwork by the time we are finished. Wausau Financial was exhibiting at a tradeshow in Las Vegas. 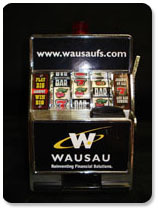 They gave away a branded miniature slot machine to their existing clients and best projects at the show. CARFAX used a mug branded as part of an internal promotion. 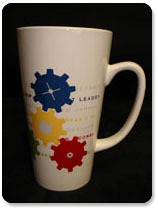 The mug was imprinted with their corporate colors, logo and buzzwords; helping to reinforce their mission. 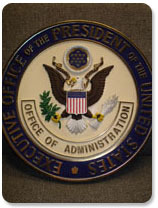 The White House uses the official Presidential Seal as podium signage whenever and wherever the President is speaking. The seal are instantly recognizable worldwide and reinforces the importance of the event at which it is seen. FLAVORx makes kidis and petis medicine less yucky by flavoring them. They used branded medicine spoons as a kick-off promotion for a new distribution chain for their product n Wal-Mart. 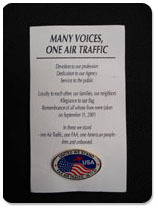 The Federal Aviation Administration issued a post 9/11 lapel pin to all employees in order to reinforce their commitment in their mission to make air travel safe for all. The Bureau of Alcohol, Tobacco, Firearms and Explosives uses a super ball which when bounced lights up with both red and blue lights, simulating a police car siren. The ball is a huge hit with both those who are young and young at heart. Congressional Quarterly used a simulated Blackberry stress toy to promote its PDA messaging service. The piece was a huge hit it greatly helped boost sales of the service. The director of the Bureau of Alcohol, Tobacco, Firearms and Explosives uses a commemorative badge set as a gift to dignitaries. The piece is a set of all nine badges used in the history of the agency. The lid of the box is imprinted with the years the particular badges were used. The George Washington University used Matchbook sized fold-up map to convey tons of information to incoming freshman. In addition to a map of the city, campus and Metro system, the second side was imprinted with multiple departments contact information. This piece won first prize at both the Chesapeake Promotional Product Association's PEAKE Awards and the American Marketing Associationis M Awards. The Human Rights Campaign used an automatic folding umbrella as a donation premium for their Federal Campaign. Potential donors were enticed to donate in return for receiving the umbrella, which further reinforces HRC's brand when used. 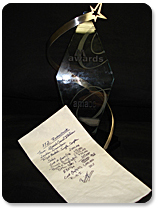 Group Logic created a lucite award from their news software launch. The CD was embedded in the Lucite along and the accompanying cop commemorated the event. The piece was given to essential people, who made the launch possible. The Magazine Group used an eye-catching Lenticular postcard to entice associations to consider their publishing services for their trade magazines. 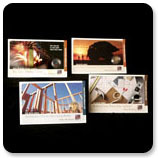 The postcards were sure to be noticed by the recipient, building both the TMG business and brand. The George Washington University used a simulated marble miniature White House as a commemorative souvenir for attendees at their inaugural ball. The piece instantly became a highly desired collectible amongst the university community. Bahama Clipper was founded in the spirit of the golden age of travel and the love of the islands. When travel was an adventure and the islands were unspoiled. The objective was to produce a line of custom wearables for retail sale. To create a variety of stylish wearables at a variety of appealinbg price points. Quality and fashion were both critical elements. Mac Mannes, Inc.is complete line of wearables n t-shirts, polos, sweatshirts and hats. Each included a custom woven label, creating a truly retail appearance. We used bright island colors as well as vintage, distressed materials and imprints. PBS has created a new animated TV show, entitled Car Talk. To create a buzz for the show and to reach out to there perspective affiliates in an engaging and interactive manner. Mac Mannes produced a custom imprinted air-freshener, imprinted on both sides with the animated characters and show logo. Two hundred pieces were shipped with tremendous success, adding immeasurable punch to the show. The demand has been so high, additional pieces have been created and PBS is considering a huge (100,000+) roll-out of the piece for there mass marketing efforts. 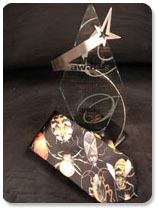 The piece was also a finalist at the 2008 DC chapter of the American Marketing Associationis M Awards. 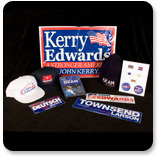 Political campaigns seek a distributor which can host an online store as well as warehouse and the ship merchandise. A vendor to such a campaign must be incredibly trustworthy because it handles customer service which can play a tremendous part in the success of a given campaign. Mac Mannes staff handles all aspects of the sales of the merchandise selected by the campaign, who still has complete control over what is sold. By keeping shipping in house, costs are able to be kept low and efficiency is maximized. During their special series, "American Presidents: Life Portraits," CSPAN discovered a wealth of interesting information about US Presidents. The company wanted a way to share this information in a way which would increase exposure of their brand name. The idea to make a totally custom set of "Fact Cards" was developed and artist Charles Fagan was commissioned to do an oil portrait of each of the Presidents. Each would have his own card with picture on the front and biographical information on the back. We worked directly with a manufacturer in creating the set. The cards could be used as gifts at various activities. 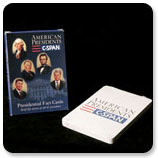 After being used as gifts, the cards were placed on the C-Span website so the public could purchase sets. Not only are the cards educational and important for their connection with American history, but they allow C-Span a way to further connect its name with earnest political coverage. Van Metre Homes came to us and wanted to figure out a way to increase the return value of their print work. They were running radio ads on local stations, and doing print ads through the Washington Post and other newspapers, as well as sending direct mail postcards. Van Metre wanted to distance itself from the competition using a creative direct mail marketing tool. We created a unique direct mail piece which would stand out in the mail. We wanted the end user to remember Van Metre and their new home developments just from seeing the customized piece. We matched up photos from the new developments and paired them with elements of building a new home such as dirt, wood shavings, pennies and electrical wire. These "bubblegrams" would be sent out in phases during the building process: Planning and Design, Groundbreaking, Start of Construction, Decoration, and the Celebration of the New Homes. These innovative "Bubblegrams" yielded tremendous feedback from the prospective homeowners they were sent to. Many called in to set up appointments and came to open houses just from seeing the postcards. Traffic to Van Metre's website also went up drastically up in the weeks following the mailing. Boeing needed a gift for special guests at various events during the development of the Missile Defense Project being built in Alaska, which would both show the product that is being developed and would be something that the guests would appreciate and display. An exact replica of the missile being developed was created as well as a stand which it fits into. 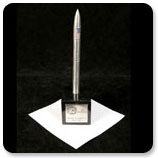 The missile was adorned with a full color US flag, and the stand was adorned with a plaque commemorating the Missile Defense Project including the Boeing name and logo. This rocket replica was very popular among Boeing's guests. Additional orders were placed for the replicas so they could be used as gifts for Senior Staff. Boeing now had an attractive piece bearing its logo which recipients would prominently display. Scrap Magazine, the trade magazine of the Scrap Recycling Industries wanted a year-end thank you gift for their advertisers which would be very useful. A flashlight with the Scrap logo printed prominently on its handle was decided upon. Those who received the item would surely keep it around for its practicality and economical size. 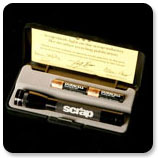 Scrap rewarded every advertiser with a flashlight and carrying case, allowing Scrap to show its appreciation, as well as have their logo, emblazoned on a quality and useful item, in the hands of a wide variety of people. George Washington University's Alumni Association wanted a keepsake for Homecoming which would both capture the spirit of the school and appeal to alumni. The item had to be something which would draw attention to the school's brand name. 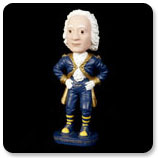 A bobble-head doll was developed of the school's mascot, the Colonial, adorned with the school's logo, which would be given to all alumni attending Homecoming. The bobble-head would promote school pride and give alumni a fun way to display their school's mascot. GW Alumni left Homecoming with a keepsake which was both meaningful to them and would attract the attention of others to GW's brand name. PBS had a new cooking show which it had to promote. It needed a gift set which people would use often and thus enhance the visibility of the new show. A custom wok set was developed, adorned with the PBS logo on the handle of the wok. 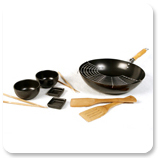 Such a set would attract the attention of cooking enthusiasts, making it a very efficient and practical promotion. PBS was able to reach its target audience by providing a valuable culinary asset. Their brand name would be placed in front of those who would be interested in the new show by means of a high-quality product. The American Gastroenterological Association was putting on their annual conference and was interested in new avenues of funding. They were eager to take on new sponsors, so they wanted a way for additional sponsors to advertise. 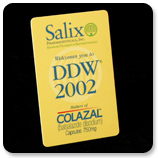 The key cards of the hosting hotel were sold as ad space to a Pharmaceutical company. Mac Mannes was able to have the custom artwork and color scheme from the Pharmaceutical Company printed on the hotel key cards. The cards would be indispensable to all attendees, ensuring exposure of the sponsor's brand name and logo. By selling advertising space on these hotel key cards, AGA tapped a new source of revenue, allowing for further spending towards its various goals. The Pharmaceutical Company, from whom the new revenue came, achieved unique and valuable exposure to a target audience. The Human Rights Campaign wanted a team building promotion, a way to make many individuals feel like part of a unified organization. They had in mind something which would appeal to employees and was substantial enough to ensure the message of teamwork got across. 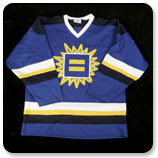 A custom, colorful, hockey jersey was designed which would inspire the idea of teamwork and a mutual involvement among Human Rights Campaign employees. The back of the jersey featured "Team HRC" in the space for the name. The number of the current year appeared under the name to emphasize the importance of the present. These jerseys improved both morale and efficiency among employees. Every staff member now had a jersey which linked them directly to the Human Rights Campaign team. Others see the group as unified and are prompted to inquire about the Campaign.